Guemes Island has a verity of activities waiting for you to explore. Guemes Island was a traditional location for the Samish tribe’s winter villages. Around 1873, the Samish, displaced due to government decisions, established a new village on Guemes, near Potlatch Beach. Because they occupied the only natural spring on the island, the Samish were forced off the island by their neighbors in 1912. Guemes Island was named by the Spanish explorer José María Narváez as Isla de Güemes, during the 1791 expedition of Francisco de Eliza, in honor of the Viceroy of Mexico, Juan Vicente de Güemes Padilla Horcasitas y Aguayo, 2nd Count of Revillagigedo. In 1841 Charles Wilkes of the United States Exploring Expedition gave the name “Lawrence Island” to Guemes Island, to honor the American naval officer James Lawrence. He also gave the name “Hornet Harbor” to Guemes Channel, for the USS Hornet, which Lawrence commanded during the War of 1812. To the waterway north of the island, part of Bellingham Bay, Wilkes gave the name “Penguin Harbor”, for the British vessel Penguin, captured by Lawrence. These names disappeared after 1847, when the British Captain Henry Kellett reorganized the British Admiralty charts, in the process removing the “pro-American” names given by Wilkes and affirming pro-British names and Spanish names. Guemes Island was also commonly known locally as Dog Island in the early 20th century, from a large number of Salish Wool Dogs living wild on the island. 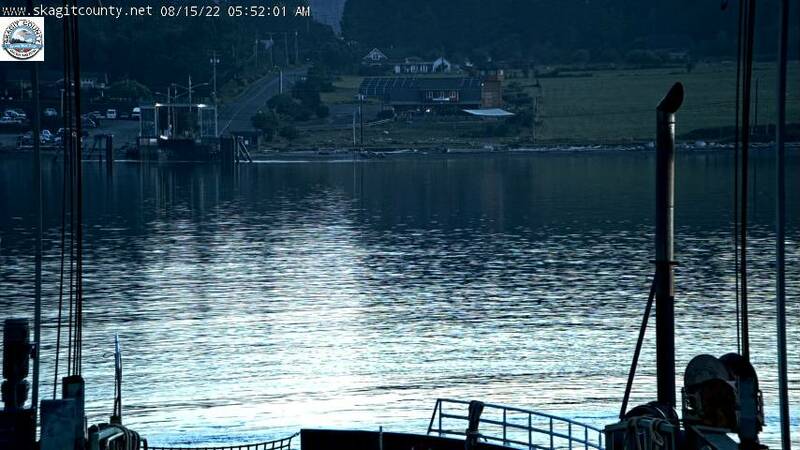 Below is a live image of the Guemes Island terminal looking from the Anacortes side. You can see the parking area on the left side of the image. The parking area is mainly used by islanders that are walking onto the ferry. When pulling into the parking area there is a small coffee stand called Riff Raff Coffee that gives coffee by donation. Next to the parking area is the holding lane for the ferry. If you look just right of the landing you can see the waiting room. Now don’t expect anything too exciting waiting in the small waiting area; It gives you a place to stay warm on those rainy Washington days. The building on the right side of the image is the Guemes Island General Store.